Spring is here and volunteers are as busy as bees at the Thompson-Ames Historical Society getting ready for another year of celebrating Gilford's cultural heritage. But even more volunteers are needed! We still are asked the questions, "What is Gilford's Historical Society all about?" and "What opportunities are there for people to serve as volunteers?" To give interested folks an opportunity to visit with some of the current T-AHS Board members and at the same time to find out about Gilford's Historical Society, we have planned a "Welcome Get-together for Volunteers" on Saturday morning, April 9th. Light refreshments will be served at the 10:00 a.m. get-together, which will take place upstairs in the Grange Museum Building, at 8 Belknap Mountain Road, in Gilford Village. Carol Anderson will tell about the "Heritage Arts and Crafts Bees", an outgrowth of the popular "Rug Braiding Bees" which Kathy Lacroix and Marion Ekholm had arranged during the autumn and late winter months. The Bees are scheduled to continue to meet during the third Saturday morning of each month. The variety of crafts to be offered will reflect the interests of the folks of all ages who wish to be involved. Knitting is being planned while rug braiding will continue as people get-together to socialize while they help one another out. We hope that some of these projects will be on view during Old Home Day so that visitors can see what has been worked on. Also perhaps during Open Houses and on Old Home Day, some of these project participants will be willing to demonstrate the arts and crafts that they have been learning so the others may become interested in trying a hand at various vintage arts and crafts. Kathy Lacroix has been working out a volunteer schedule to meet the needs of the kindergarteners and the third-graders who will be taking field trips to Gilford's three museum buildings in May and June this year. 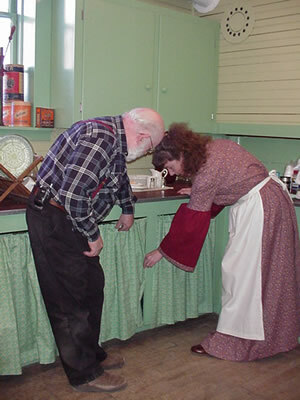 Learning to volunteer is made easy at Thompson-Ames Historical Society. Scripts are available for each of the theme areas in the three museum buildings. Opportunities to assist or "shadow" tour guides or docents are also available to help familiarize volunteers in learning process. Diane Mitton, Thompson-Ames Historical Society's collection manager, has many opportunities for volunteers to participate in acquiring and preserving items and archival materials that help preserve and celebrate Gilford's cultural heritage. Learning to conduct and tape oral histories is just one aspect of this broad task. Curator Judy DalPan is eager for help in investigating and proposing items that would be meaningful to Thompson-Ames Historical Society's collections. Assistance in setting up displays is another challenging avenue to help meaningfully celebrate Gilford's cultural history. Don Frost has been coordinating efforts to create wooden toys of historic design to have ready for field trip experiences as well as for sale to the public. If your interest is sanding, or cutting out with a jig saw, or doing research about historic items, or . you-name-it., your participation would be warmly welcomed. Stan Piper is always ready to welcome participants who wish to get involved in activities to enhance the museum buildings inside and/or out. Dale DalPan and Stan helped Carol Anderson hang her under-the-counter curtains in the Grange Kitchen in time for the Saturday morning, March 26th "Homestead Room Open House" -- a challenging time crunch which they successfully met! A current project is the creation of more shelves for the office so that T-AHS's ever-growing archival displays are well organized and readily available for reference. Getting ready for programs involves arranging for refreshments - which necessitates volunteers to provide goodies and even a Hospitality Coordinator to keep everything organized. With the thawing of winter's snow comes the time when the grounds will be ready for raking and gardens ready for tender loving care. These are just some of the many opportunities for interested folks to say, "That's something that I'd be interested in doing as a volunteer!" Whether you wish to find out what Gilford's Thompson-Ames Historical Society is all about, or socialize with fellow Gilfordites who are interested in our town's cultural history, or become a volunteer, do mark your calendar for Saturday morning, April 9th and attend the "Welcome Get-together" in Grange Hall. Remember to check T-AHS's website www.gilfordhistoricalsociety.org for the latest news and calendar listings.